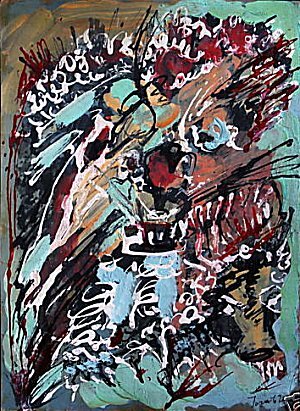 Asger Jorn (Danish, 1914-1973). Painting: Mixed media, gouache, paper, size unframed 11 3/4 x 8 1/2 inch. Signed, dated 1962. Condition: The painting is in very good condition considering the age. Contrast on the photos is at times enhanced to show the details of a work. Artfakes.dk: This painting is FAKE number 500 on eBay signed Jorn. NOT an original work of art by the famous Danish Cobra painter. The painting is awful. 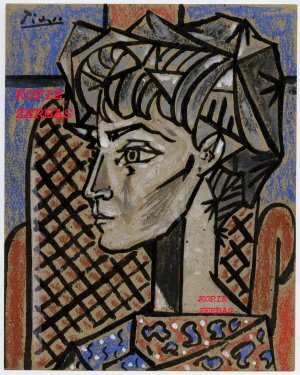 HELLO ART COLLECTORS, I AM AS YOU CAN SEE IN MY EBAY A STAMP DEALER AND HAVE NOTHING TO DO WITH PAINTINGS, BUT A FAMILY´S FRIEND OF MINE WHO´S FATHER WAS AN INTERNATIONAL BUSSINESS MAN HAS BOUGHT THIS ORIGINAL PAINTING AND OPTHER FROM PICASSO AT THE EARLY 50TIES TO 70TIES UNKNOWN?? FOR MORE SAME ITEMS ,PLEASE SEE MY SHOP OFFER!! !A GREAT RARE INTERESTING ITEM !!!!!! Oh, we like that kind of fairy tales very much. The painting is overpainted with "Kopie Zerbas". 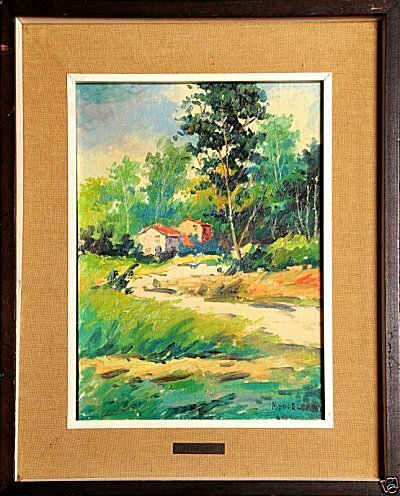 Is the painting a copy painted by the seller himself? Seller: overstockdealers. Member: since Nov-01-02 in United States. Item location: Henderson,NV, United States. Feedback: 99.3 % Positive. Christie's and Sotheby's are draging their feet. The person who owns this is getting up there in age and needs to sell it so it's not left to his Inheritance. As I'm sure you all know this is a wonderful piece to add to anyones collection. It is hard to believe that Hofstade has authenticated this painting. 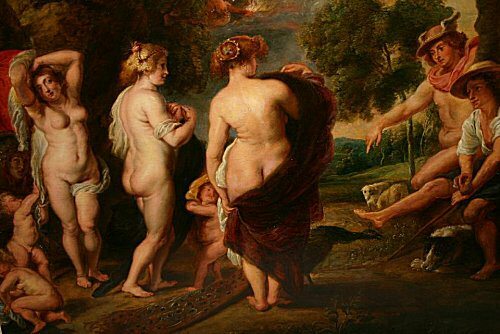 The figures are poorly painted and far away from Rubens' style. In our opinion this is NOT painted by Rubens. We think it's a copy painted by an unknown artist. 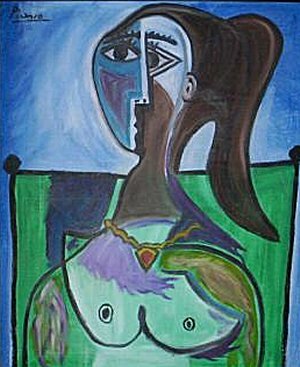 Pablo Picasso's Tete de Femme, Bust of a Seated Women, is being sold to art lovers or collectors. The painting is an original oil on canvas and is currently framed by solid wood. Picasso's signature appears on the top left side of the painting. On the reverse side of the painting it is date 05/05/67. The work belonged to an elderly gentlemen (who was the first owner), who lived in the French Rivera during the 1960's - 1970's. During this time he acquired his art collection from various artists. He bought the painting from a provincial house sales in Cannes in the 1970's. The current owner will supply a letter of provenance, a transfer of ownership, (from all previous owners) a Certificat of Assessment of Style & Value and a print transparency for art specialists. It is therefore being sold after Picasso and it is not authenticated. I do not take the responsibility to assert the authenticity of this painting. This is an excellent piece of art that has not been authenticated since Picasso's death. Thank you and good luck on your bidding. The seller is a FAKE SELLER. The seller: "Appraise for 2,500.000.00"
He/she is crazy. This painting is worth $50,00. LANDSCAPE, oil on canvas,signed MODIGLIANI. Artfakes.dk: Of course NOT. NO art expert at any place in the world will say: This is a genuine work of art by Modigliani. "Looking for a possible author, nobody listed jump out, but Amedeo Modigliani [Livorno (IT) 1884 - Paris (FR) 1920]. Amazing painter known for his nudes and long-neck portraits and his bohemian life. Besides, the painting is different from usual themes of Amedeo Modigliani's works and the signature is different from usual too. So a such probable attribution was clearly simply ignored untill now. Last year, during my indipendent studies on my little collection from Impressionism and Expressionism era, I payed my attention on this painting and started to make my research and found very interesting connections. However the painting offered here it's a landscape and this'd make it one of the RAREST work by Modigliani about subject if it was by him. Another strangeness is the signature. Usually we can see Amedeo's signatures in cursive, this one instead is in block capital letters. This fact was the worst aspect for my research: the signature of course does not match with his well known one! After a while, unforeseenly, I have made an amazing discovery that strengthened my beginner theory: the same kind of signature could be seen at least in 2 paintings (see last photos, 8th and 9th, at the bottom of this page): "Bride and Groom", oil on canvas 1915, MoMA NYC (Frederic Clay Bartlett donation) and "Portrait of Leon Indenbaum", oil on canvas 1915, Henry Pearlman prop., NYC". Selling this amateur painting being an original oilpainting by Modigliani is a criminal action. How can you tell the difference between a fake and a genuine piece of art?